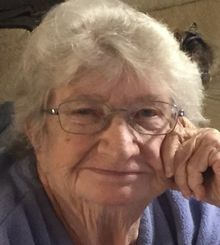 Mariah Angeline Sparks (Angie), age 82, passed away peacefully in her home on February 8, 2019 surrounded by her family and friends. She was born December 2, 1936 in Buchannan County, Virginia to John and Pattie Lowe. She married her longtime friend and love, William Joshua Sparks, Jr. in 1957, who preceded her in death in 2008. Angie loved to love on people. She crocheted beautiful blankets for her friends and family. Her hands were rarely still. She also shared her love with food such as her famous BBQ, potato salad and the most amazing fresh biscuits and gravy. She was a foster mother for many years, raising kids as if they were her own and even being a Mom to her son's dear friend, Joe Robinson, who lost his own mother years ago. For many years Angie worked as a nurse taking care of the elderly and in later year's she cooked for children in Stafford County Public Schools. Her work suited her servant heart. Her life was a living example of the Bible verse, Ephesians 4:32 — "And be kind and compassionate to one another, forgiving one another, just as God also forgave you in Christ." Angie is survived by her sisters Ethel Fanning and Shirley Thibault, her daughter Mellie Huffman and husband Mike, son Larry Sparks and wife Christine, and son Joshua Sparks; grandchildren, John Huffman, Robert Huffman, Christine Morris; plus 7 great grandchildren, 1 great great grandchild and her many nephews and nieces. All of these she loved and touched deeply. The family will receive friends on Tuesday, February 12, 2019 from 6:00 p.m. to 8:00 p.m. at Memorial Funeral Home in Hopewell. Her funeral ceremony will be on Wednesday, February 13, 2019 at 2:00 p.m. in the funeral home. Final rest will be in Merchants Hope Memorial Gardens. Add Photos, Videos, Music that tell the story of Mariah's life.